Ranked battling have been added! I'm ecstatic to finally announce the exclusive OPPixelmon plugin which allows trainers to queue up and battle others of similar skill levels. Winning/ losing these matches will affect your ELO (or "points") and these will determine your place on the server's ladder. Every month will be a new season, where the ladder resets and the champions at the top receive fabulous rewards! 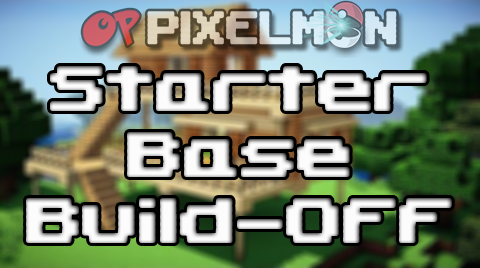 /pixelpvp join:- This is used to join the queue and wait for your opponent. /pixelpvp leave:- This is used to leave the queue. /pixelpvp ladder:- Shows the ranking of the players according to their elo. /pixelpvp show:- This updates the scoreboard incase of a glitch. We've added a new site to vote on! Also, the top 5 voters of this month will be entered into a draw for a $20 Store voucher where each vote counts as an entry! ex. 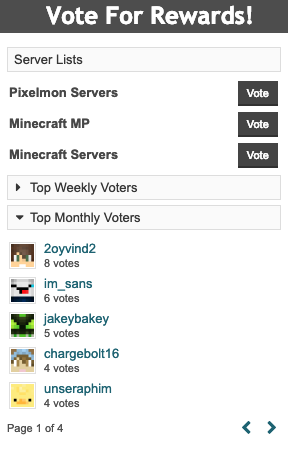 If these are the top 5 monthly voters by the end of the month, 2oyvind2 will have 8 entries, im_sans: 6 entries, jakeybakey: 5 entries, etc. Our server machine was hacked and used to send out spam and DDoS attacks to other servers. Luckily, it was swiftly recognized by our host and has been shut down and put into rescue mode (you can think of it as a lockdown). I'm currently in contacts with their support to gain access back to the machine and restore everything. I will be updating this post and #general on Discord as I assess the damage done and provide an ETA to when the server will be back online. Lvl 100 6v6 Gen 6 Doubles OU(both players have to use 3 mons each).